A perennial favorite! 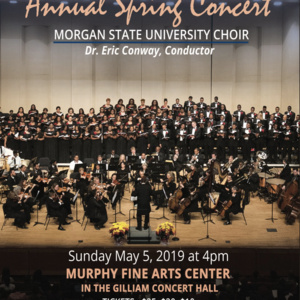 It's a rite of spring: the beautiful music provided by the acclaimed Morgan State University Choir in their Annual Spring Concert with orchestral accompaniment--with Dr. Eric Conway at the helm. Join the Morgan State University Choir as they close yet another triumphant season. Their rich, signature sound, the breadth of their performance styles, and the vocal skills make this celebrated choir a much sought after ensemble. AUDIENCE NOTE: The Murphy Fine Arts Center will observe and implement the industry standard protocol for Late Seating as we wish to minimize disruptions for seated patrons. Latecomers--and those who are outside of the Concert Hall when the performance begins will be asked to wait quietly in the lobby until the front of house staff members (i.e. ushers) are able to seat you during an appropriate break in the performance.